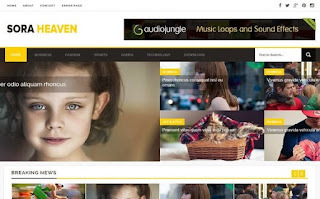 Sora Heaven Blogger Template is a responsive, clean, stylish and professionally designed template for anyone who wants to make great website. This template is perfect choice for newspaper, magazine, editorial, personal blog, entertainment (movie, music and photography), fashion. It’s design with modern style, simple color combination, clean and modern look, and has been built by using some of the most popular current design trends.